About a year ago I found this old hoodie in the back of my closet. Wrinkly with a stale hadn't been worn in forever smell, I pulled it down. Memories came tumbling down with it. The spring of 1985. Nearing completion of ninth grade & my less than illustrious career at North Richland Junior High. As freshmen, we were the big dogs of junior high & not the tadpoles of senior high. Spring football that year included shared practices at the high school that we were bused to. 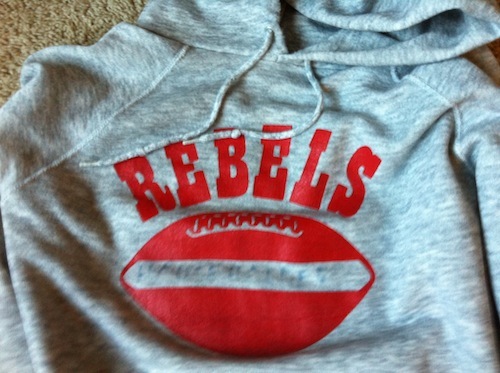 And each of us were given Rebel football hoodies so we'd look the same on the field at Richland High School. A proud moment it was, receiving this hoodie from Coach Staples. You can still make out HOUSEHOLDER scrawled across it in permanent ink. Since rediscovering it, I washed it & pull it out to wear around the house from time to time. This morning as I was helping my six year old learning to read masterfully daughter, Mary Elizabeth, get her coat on she read it. "Ree-buhls. Where'd that come from, Daddy?" "Oh, Honey, I got this a long time ago. Almost 26 years ago. Before I went to high school." "Wow, Daddy, you haven't grown much since then." Melanie laughed out, "Haven't grown much?," looking at my slight 40-something belly. "Well, Mary, Mama & Daddy are basically the same size as we were in high school. Some things," motioning from my chest to tummy, "may have just shifted around a little bit." She flew out the door to the bus. My mind tumbled. Not about physical changes since high school, but real growth. Maturity. If I knew then what I do now, how would I have been different in high school? Who would I have treated better? How would my life be different as a result? Most of you, Dear Readers, are not in high school anymore. Take a moment & write a comment. What do you wish you'd known or done differently growing up? What do you need to, maybe as a result of reading this post, change today?